You’ve completed some coaching training and now you’re ready to begin coaching people. Where do you find them? How do you ask someone to coach with you? I’ll show you four proven ways to approach people to begin coaching with you. When I was ready to begin coaching people I felt awkward. The people I considered coaching were either my friends, or people I didn’t have much relationship with. I was at a loss for how to ask people to coach with me. I tried several ways to ask people to coach with me. It worked! I began coaching with three people, one in person and two by Skype. I focused on coaching those three people well. Near the end of coaching with them, I asked each for a 2-3 sentence description of the benefits and results they received from coaching with me. I used those quotes in my next round of asking people to coach with me. Be prepared. Have your coaching “welcome packet” ready to send. It might include something about what coaching is, an agreement, and other forms or information. Keep it simple. Plan to email it. Focus on the result. As you talk about coaching don’t talk about the process of coaching – listening, asking questions, The COACH Model, etc. – instead focus on the results that the person will receive from being coached. My article on not selling coaching but results might help you. Don’t let geography limit you. Coaching works just as well or better over the telephone or Skype. As you think about who to coach, consider those who live in the next city, state or around the world. Money or not, it’s the same process. Whether you are charging or not you still have to ask people to begin coaching with you. Get over having to ask. This is the biggie! You will have to ask people to coach with you. They will not come to you. You must go to them. You must offer to coach. Think about and deal with your hesitations to offer to coach people. Sure, you could always use more training, more practice, a credential, etc. But what you really need is experience coaching people. And for that you must ask people to coach with you. Coaching will help them. You will help them. If you have trouble with the concept of asking people to coach with you, I suggest you find someone to coach you on the self-limiting beliefs you may hold. If it’s asking technique you are missing, read on! 4 proven ways to find people to coach. 1. The “help me” approach. Everyone likes to help someone who needs help. This approach is to ask the other person to help you by letting you coach him. Say something like, “I’ve just finished a coaching workshop and one of the assignments is that we coach people to practice what we learned. Would you help me out by letting me coach you?” If you haven’t attended a training lately you could change it to, “I’m trying to get my professional coach credential and I need 30 more client coaching hours to do that. I’m looking 3 or 4 more people to let me coach them to meet that requirement. Would you be willing to help me out?” This approach is pretty much a sure thing. 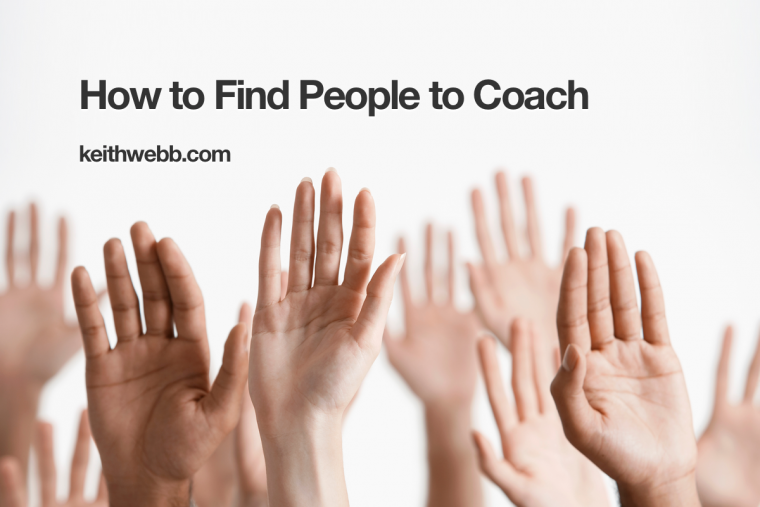 Ask 5 people, and 3 or 4 will agree to begin coaching with you. 2. Find a group to support. A lot of organizations have people that need to be coached: schools, churches, community associations, nonprofits, etc. Think of the groups you have some expertise or affinity toward and go speak to the person in charge. Say something like, “I am a professionally trained coach and love this organization. I would like to volunteer to coach up to 6 of your small group leaders in person or by telephone.” Be ready to explain what coaching is and offer the person in charge a complementary coaching conversation so they can experience what it is like to be coached. In the end, you have to find a way that works for you. Which of these ideas do you want to do first? What other ideas come to mind? Let me give you a challenge: This week, ask three people to begin coaching with you. The only way to learn to do this well is to do it. Once you’ve done it a few times the awkwardness goes away. You begin to believe about yourself what those you’ve coached with already know: how worthwhile it is to coach with you! Who will you ask? Question: When you started, how did you find people to coach with? You can leave a comment by clicking here.